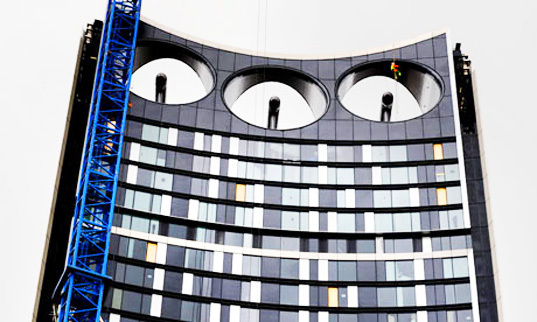 Prepare to be blown away: the latest addition to London‘s skyline is a striking modern skyscraper that is heralded as the world’s first building with wind turbines built in! Nicknamed “The Razor”, the 148 meter-tall Strata tower is topped with a trio of turbines that will produce enough power to meet 8% of its energy needs. We’ve seen skyscrapers studded with wind turbines before, but the Strata is the first building to integrate turbines directly into its facade. Developed and contracted by Brookfield Europe, the tower is a tricky engineering feat indeed, especially granted the gusty blasts of wind that construction crews had to deal with while raising it. Measuring in at 42 stories tall, the Strata tower has enough height to eclipse the buildings surrounding it, allowing it to take full advantage of the area’s 35mph wind speeds. The tower is also designed to utilize the Venturi effect created by nearby structures to force wind through the turbines at accelerated rates, generating an expected 50MWh of electricity annually. According to The Guardian, each of the building’s 19KW turbines will have 5 blades rather than 3, which will reduce noise during operation. Meanwhile a five-ton base outfitted with vibration dampers will keep the building securely anchored to the earth. The skyscraper will also boast other green building strategies such as the exclusive use of natural ventilation, high-performance glazing, and other energy efficiency measures that will keep the building’s power use 6% below current building requirements. 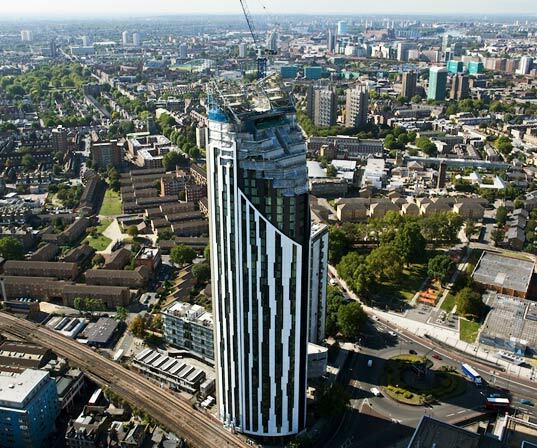 The Strata tower cost £113 million and is set to complete construction this April. The skyscraper’s revolutionary design makes bold steps towards meeting the UK’s requirement that all new buildings be zero-carbon by the year 2019. Interesting, we should concentrate more on building structures that are environmental friendly all over the world. I take it that if they require to move the building in the future. They just add wings and change the turbines to fans. The trouble long mains lead. Great idea. Great feats of engineering mixed with "green" ideas are definitely good. It does not matter who was the first, every bit of effort counts. But how about the materials and processes involved in getting this wonderful structures up, have they also gone "green"? What's the noise pollution of these turbines?? I think you have all missed the line at the beginning of the article which states "We’ve seen skyscrapers studded with wind turbines before, but the Strata is the first building to integrate turbines directly into its facade". It even has a link to the Bahrain World Trade Centre. This is actually part of the buildings structure as opposed to being placed between two parts of the building. Given that 8% of the building's energy consumption seems to be 50 MWh, the building as a whole consumes 575 MWh/year. I guess that's better than consuming 625 MWh/year. Beautiful structure! I'll make a point of seeing it when I visit London. I wonder how much electricity it generates? Prepare to be blown away: the latest addition to London's skyline is a striking modern skyscraper that is heralded as the world's first building with wind turbines built in! Nicknamed "The Razor", the 148 meter-tall Strata tower is topped with a trio of turbines that will produce enough power to meet 8% of its energy needs.